Chronicles of coaching American football in Italy (2008, '09, '18 & '19), in Sweden (2010, '16 & '17), in Switzerland (2012), winning a Division III National Championship in France (2012-13), in Spain (2015 & '16) and in Mexico (2017 & '18) as well as walking the Camino de Santiago in August-September of 2010. Palermo Corsari Game II...A VERY INTERESTING DAY! I have been married to Laurie for over 46 years. Our oldest son, Andy, lives in Las Vegas, Nevada with his wife Jenn and their son Kevin. Our youngest son Mike lives in Oxnard, California with his wife Vanessa and their kids Jacob and Mary. Although I retired from teaching in June of 2007, the 2015 football season marked my 45th year of coaching football at five high schools in Southern California's Ventura County - Thousand Oaks, Westlake, Rio Mesa, Buena and Newbury Park. In 2008, I opted to try something totally different in my coaching career and started coaching in Europe. My EuroBall stops have been in Catania, Sicily in 2008 & '09, Hässleholm, Sweden in 2010, Thun, Switzerland in 2012, Lyon, France in 2012-13 with the 12-0 National Champion Bron-Villeurbanne Falcons, Murcia, Spain in 2015, Rivas, Spain in 2016, Upplands-Väsby, Sweden in the Spring of 2016 & '17, in Mexico to coach the Europe Warriors in Aug. & Dec. 2017 and now in 2018 in Varese, Italy. Join me as I explore and chronicle my newest adventures coaching American football in Europe. My European touring also included a 500 mile Pilgrimage Walk on the Camino de Santiago in Spain in 2010. 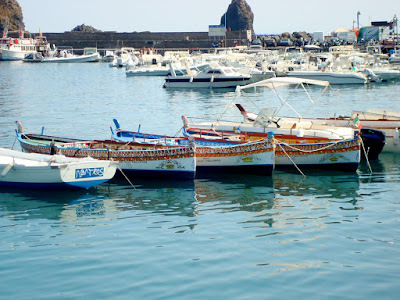 It is really starting to feel like summer in Catania with the temperature well into the 90's and the humidity rising daily. Jason and Christie left for a one week whirlwind tour of Germany, Austria, Switzerland and the Czech Republic on Saturday after practice. 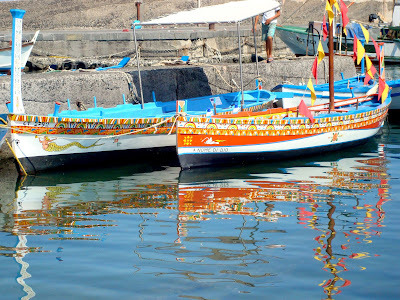 As for me, I've decided to use this week to explore the western end of Sicily by seeing sights like Trapani, Erice, Marsala and the Egadi Islands. I considered going to Malta but decided against it with my trip to the Palio in Siena next Monday through Wednesday and the arrival of my bride, Laurie, in Catania next week on Thursday, July 3rd. So, Sunday I just hung out at Malibu trying to beat the heat. 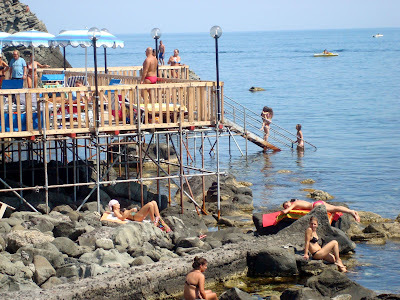 I strolled down to Aci Trezza for some granita to cool off and just pondered the many sun worshippers on the rocks. It's time for a tough decision! As I have mentioned before, these wood and sometimes steel lidos have sprung up all over the island in the last two months. You pay an entry fee to use them and chaise lounges are usually included in the entry fee. The big plus is the obvious comfort and the relative ease getting in and out of the water. Your other option is to lay on the rocks for free. I don't think this would be very comfortable but I would guess that a third or more of the beach goers opt for the rocks. 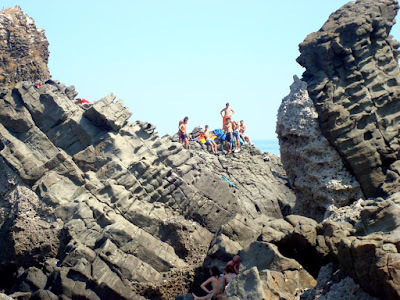 Some will swim or boat out to the big rocks in the harbor to add a dash of adventure to their frugality. 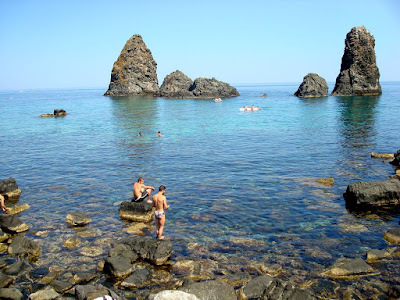 The lure of these rocky beaches and the reason to endure any rock induced discomfort is the crystal clear, warm water. In Europe they have all sorts of calcio (soccer) leagues and tournaments. Some of these leagues are by country with several clubs representing cities competing, some are made up of all-star teams representing countries, some the best clubs in a country compete against the best clubs from other countries. In other words, don't worry if your favorite club or country gets eliminated, there will be another competition starting very soon to give everyone renewed hope that their favorite club or country will come out on top this time! As I have mentioned before, Italians are crazy for calcio, but only if their club or the Italian National Team is involved. A few weeks ago when English clubs Chelsea and Manchester United squared off in the Champions League Final in Moscow in the BIGGEST game of that month, we went to a local pub to watch and there were only a couple of other people there who were mildly interested...if no Italian club is involved, who cares? Last night Team Italia played Spain in some tournament that is very important this month. I went to Jonathan's for a pannino at about 9:15 p.m. and NOBODY WAS THERE! I ordered and was quickly served a delicious breaded cutlet pannino with caprese smothered in french fries. I finished and still no one was there. On the drive back to Malibu I also realized that there were very few cars, scooters or pedestrians on the streets. 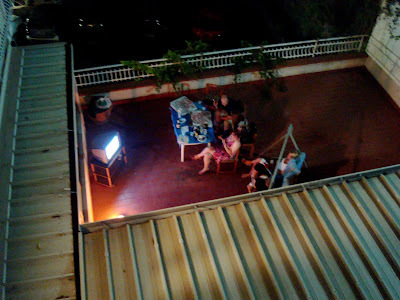 Of course, EVERYONE was at home or in a bar watching the BIG GAME! When I got back to Malibu it was fun to hear everyone in our building and all of the surrounding buildings in unison loudly yelling and screaming with delight or moaning with anguish every good or bad thing that happened to our boys in white. I actually turned on the TV and watched the second half and kind of got into the frenzy myself in a limited way, GREAT FUN! Incredibly the game ended in a 0-0 tie, who would have guessed that? In the shootout that followed Spain broke our collective hearts by outscoring our native sons 4-2. Team Italia was eliminated and Spain (cool uniforms by the way) moved on. Don't lose heart my Italian friends, I'm sure July will bring the start of yet another tournament to help unify the country in a common cause once again!